Happy New Year from Evolution Healthworks! Did you know about 92% of Americans fail to keep their New Year’s resolution? Why is this? Some say it’s cost, some blame inconvenience or just being too busy. We think it’s a little bit of all of those. Americans are hard workers and we like to have fun when we’re not working. It’s hard to change our day-to-day life drastically. 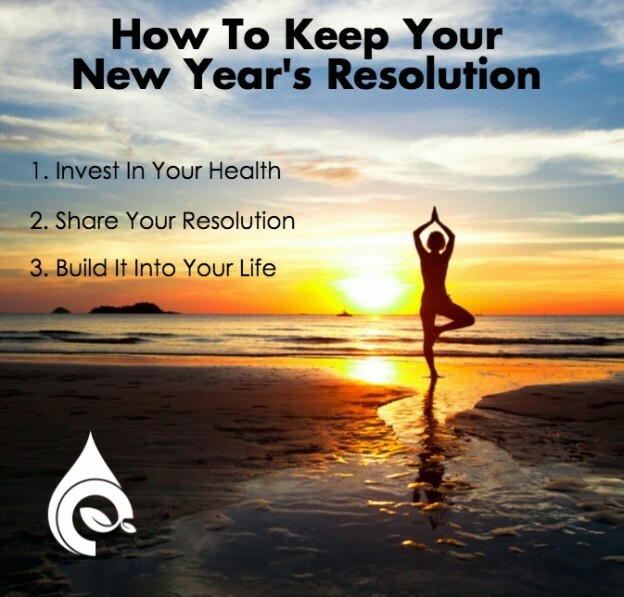 But what if there was a perfect New Year’s resolution that can have extraordinary benefits for your health without forcing you to flip your life on its head? Making a purchase is a great way to start a resolution if it can improve your health. This way you’re not only pressuring yourself by putting your money where your mouth is, but you’re also putting your money toward something that will make you feel and look better rather than spending it on material goods and sugary treats. Action tip: Install an Evolution Alkaline Water Filter in your home! According to a study published in Translational Behavioral Medicine, creating accountability for yourself by sharing your goals and progress on social media helps you achieve your goals. Ever wonder why Weight Watchers has group meetings? Ever wonder why home exercise equipment so often becomes a clothes hanger? Because there’s no accountability when you can hide at home! Action tip: Do the Gallon Challenge, drinking a gallon of water in a day once a week. Share your progress every Monday on social media! Let’s face it, New Year’s resolutions become a lot harder when they cause you to do something too far outside your daily routine. Doing that daily run you promised yourself becomes a lot harder when it’s been raining for a week. But if you build your resolution into your daily routine in a non-invasive way, you’re much more likely to keep it! It’s a lot easier to start brushing your teeth after meals than it is to lose 15 lbs, but the results may be just as noticeable! Action tip: Carry a water bottle around with you at all times. When it’s empty, simply fill it up with Evolution Alkaline Water and go about your day. You’ll be amazed at how much more you drink and how much better you feel! This entry was posted in Health on January 7, 2016 by Drink H2O.